Memories define us. So what if you lost yours every time you went to sleep? An original, haunting and deeply chilling debut thriller, and a Sunday Times bestseller in hardcover. I began this on Friday night and could not sleep...(told you, scaredy cat!) but I had finished it by Saturday afternoon.It was recommended to me and I am glad, as I probably would not have normally bought it...since the word 'thriller' is used on the cover! The central character in the book is Christine, who starts every day a fresh, free of memories. (I have seen a film similar to that in the past-where the character tattoos memos to his body...can't remember what it is called.) Christine begins to take control of her life and her memories by keeping a journal, a suggestion made by Dr Nash, and the novel is written in the form of these journal entries. Pretty early on you know something is not right and the truth is being hidden from Christine. Even though I think the plot was pretty obvious, ( I guessed what had happened to Christine quite near the beginning...but I won't spoil it for others) I still enjoyed the novel. (I am tempted to put a 'really' in front of enjoyed!). 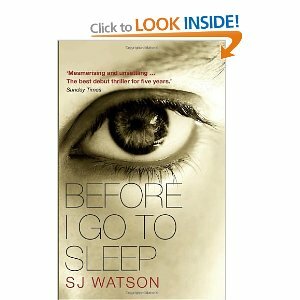 This was S J Watson's debut novel, who, after working in the NHS for years, went on a "Writing a Novel" course. The book is now being made into a film, which I will definitely seek out and watch. That book sounds pretty cool! Thanks for sharing! This is on my to read list. I have heard great things about it! I'm pretty sure you're thinking of Memento. Which I thought was a great movie, and loved how it was told backwards. Sounds like the perfect book for me! Thanks for sharing! That is it Shoshanah! A friend had reminded me of the name the other day...then I forgot it...again! Memento with Guy Pearce (Aussie actor!). 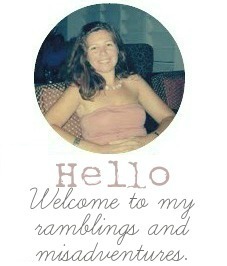 Thanks for stopping by my blog and for the book recommendation. Just a heads up that you're a "no-reply@blogger.com" blogger, which means people cannot respond to your comments. It's an easy settings change. really sarah e - glad you liked it.